Our persistent Jaunceyphile, Steve Flora, has been keeping this in reserve. 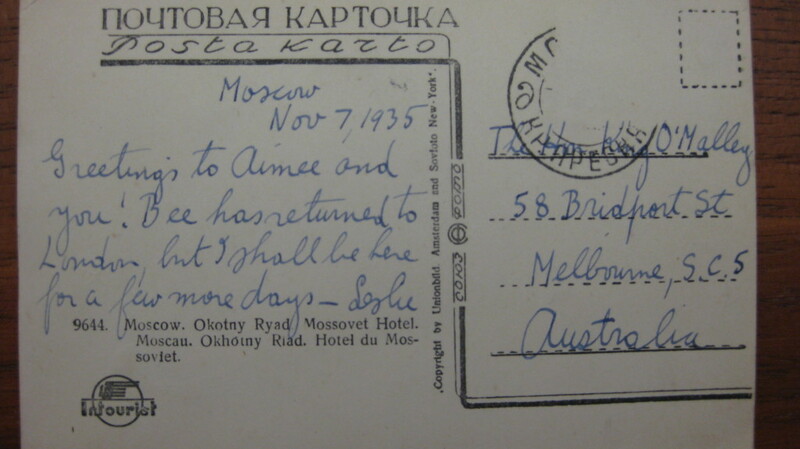 It is based on a report in the Melbourne-based Labor Call (2 April 1936) of Leslie Jauncey’s visit to Russia the previous year. Probably thanks to Leslie Jauncey’s wife Beatrice, who was ‘in no way economically depressed’, the economic downturn of the 1930s does not seem to have curbed Jauncey’s incipient peripatetic inclinations. Les liked to travel, whether to the United Kingdom, the United States, even Africa. But, as he looked further, Jauncey changed his mind. The rest of the day I spent going around Leningrad, seeing factories, workers’ flats, museums, art galleries, stores, and even an old prison. I also visited the palaces of the former Czar. 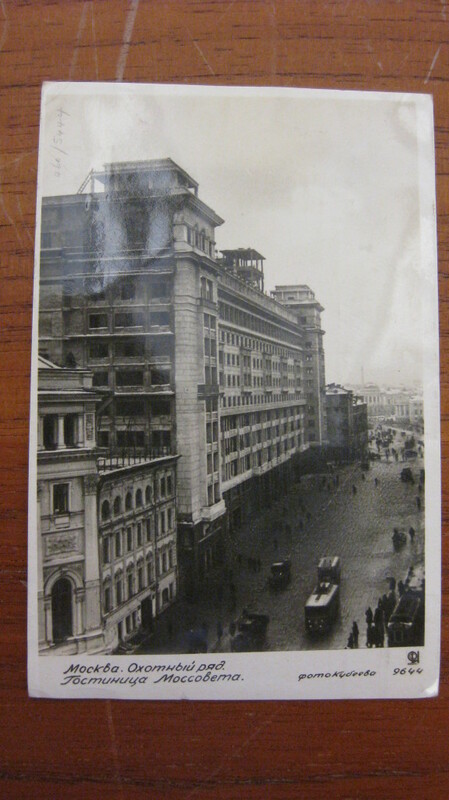 I soon saw that my first impression was wrong, and that Leningrad was a city of building up rather than falling down. In most sections of the city construction of workers’ dwellings, factories, halls, and huge paved highways was in evidence. The stores were full of people buying foodstuffs and commodities. Here and there detachments of Red Army men were rehearsing for the Great Celebrations of November 7, and were singing as they marched. Then, it was off by train to Moscow, where the pace of construction was even more intense. I stayed in Moscow for almost five weeks, visiting factories, museums, health institutions and sanitariums, police courts, marriage and divorce bureau, schools, nurseries, the famous prison farm Bolshevo, twenty performances at the theatres, moving picture shows, stores, restaurants, dental and eye clinics, railway rest homes for women, children’s clinics, maternity institutions, libraries, the anti-religious exhibit, parks of culture and rest, the new underground, workers’ dwellings, a nearby collective farm, art galleries; I walked everywhere without let or hindrance, and just gazed and gazed, taking in fine boulevards and back streets. He found the locals friendly and felt he was able to go freely about the city by himself and where he had to ask permission ‘it was granted in due time’. The shortage of food seems now to have been abolished for the most part. The peasants on the collective farms are now supplying the Soviet with sufficient. Vegetables and fruits, as well as meats, eggs, cheese, butter, etc, in the stores of Moscow and Leningrad were plentiful and varied. Vast quantities of people on the streets, and during the intervals at the theatres are eating the ubiquitous apple. Foreign observers informed me that food was plentiful in most sections of the Soviet do-day. Jauncey was a little equivocal about Muscovites’ clothing, noticing both some shabbiness but also some attention to warmth and style. He noted that new housing projects were under way to rectify shortages and that the new underground rail system in Moscow had relieved some transport problems. One fact deserves notice in both the housing and transportation difficulties. Scarcity in the Soviet does not necessarily mean high prices, and both rent and railway fares are cheap for Russians. Rent does not take more than 8 to 10 per cent of the Soviet worker’s income. Jauncey summed up as he returned to London by air via Germany (where he found there was significant unemployment). While some Russians still grumbled, recent material success had reduced the amount of discontent. I felt that the band of realists in the Kremlin has not retreated from their determination to accomplish Socialism. They have travelled a long way since the technical retreat in 1921 through the adoption of the N.E.P. [New Economic Policy] at that time. Since then the N.E.P. conducted two Five Year Plans of socialist industry and carried on the collectivization of agriculture. Socialism is not going but coming in the Soviet … The Soviet sees its beauty in the future. Here we are back in London again after a wonderful time in the Soviet. I was there five weeks and I certainly found everything most interesting. I took over a few books and distributed them to the boys. I saw John Fisher [son of former prime minister, Andrew] there. He is now on the Moscow News and latest reports give that he has an office of his own. That is all very fine! I also saw Arthur Watts, who formerly took a great part in the Australian Freedom League against conscription. All in all conditions in the Soviet are showing definite signs of improvement and food is very plentiful. Clothing is also very adequate now. My work on the Soviet is going forward, but is not quite certain of results because of the fact that war seems to be getting nearer each day. If war breaks out, then all efforts at getting a clear story will be fruitless … I am still very happy over what is going on in the Soviet and it is pleasing to know that your and my support of the Soviet over the years has been justified. One thing pleased me immensely about my trip to Russia. Bee came away just as enthusiastically as I did. She has full confidence in the Soviet and its leaders. Jauncey never completed his work on Soviet Russia, seemingly due to moving his base from Britain to the United States and to health problems which started to affect him around 1936. Sources: Jauncey to O’Malley, 15 November 1933; O’Malley to Jauncey, 19 December 1933; O’Malley to Jauncey, 15 November 1935; Jauncey to O’Malley, 20 December 1935; Jauncey to O’Malley, 3 February 1936: NLA MS460/5326, 5328, 5447, 5448, 5462. On Arthur Watts’ wife, Margaret Sturge Watts (Maggie Thorp) see this.